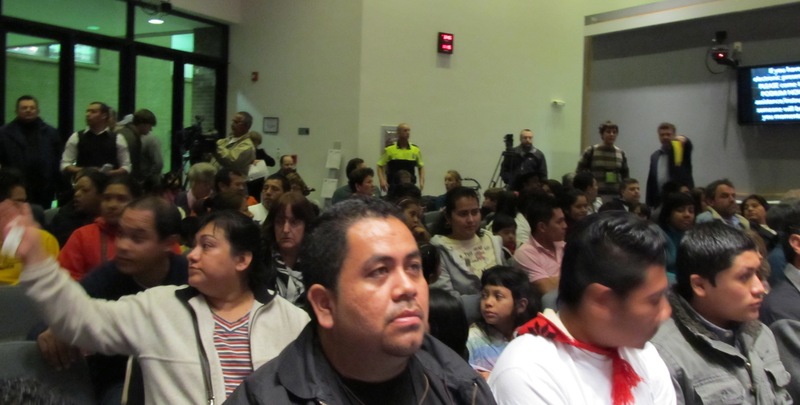 A new report from NCFIRE (North Carolina For Immigration Reform & Enforcement) shows that we have over 350 charges, against roughly 101 Illegal Immigrants, due to be heard in NC Courts. And this is only from the time frame of October 14th Through December 31st of 2013. “101 confirmed, and highly probable, illegal aliens charged with over 350 child rapes of NC children! 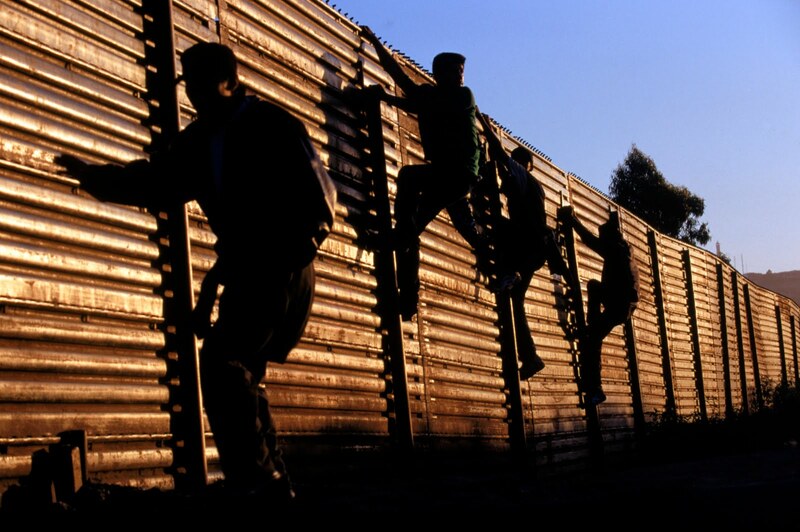 And our leaders in Washington & Raleigh are pushing for AMNESTY? Durham City Council Meeting 11/15/2010. Chambers were FULL of Illegal Immigrants. Respectfully submitted by SilenceDogood2010 this Twenty Third Day of October in the Year of our Lord, Two Thousand Thirteen. The MSM blames the republicans for the Shutdown and particularly the ‘TEA Party Caucus’ in congress. MoveOn is even calling for Sedition charges against them….but that’s another story altogether. Today, I want you to focus on the Debt Limit and WHAT our leaders have done to us. (b) The face amount of obligations issued under this chapter and the face amount of obligations whose principal and interest are guaranteed by the United States Government (except guaranteed obligations held by the Secretary of the Treasury) may not be more than $14,294,000,000,000, outstanding at one time, subject to changes periodically made in that amount as provided by law through the congressional budget process described in Rule XLIX  of the Rules of the House of Representatives or as provided by section 3101A or otherwise. Now, I’m posting ONLY a short section of the text from the CR that was passed on Wednesday night. (a) SHORT TITLE.—This section may be cited as the ‘‘Default Prevention Act of 2013’’. (b) CERTIFICATION.—Not later than 3 days after the date of enactment of this Act, the President may submit to Congress a written certification that absent a suspension of the limit under section 3101(b) of title 31, United States Code, the Secretary of the Treasury would be unable to issue debt to meet existing commitments. (1) IN GENERAL.—Section 3101(b) of title 31,United States Code, shall not apply for the period beginning on the date on which the President submits to Congress a certification under subsection (b) and ending on February 7, 2014. (B) the face amount of such obligations outstanding on the date of enactment of this Act. An obligation shall not be taken into account under subparagraph (A) unless the issuance of such obligation was necessary to fund a commitment incurred by the Federal Government that required payment before February 8, 2014. Pay very close attention to (c) Suspension. Do you understand what you just read? 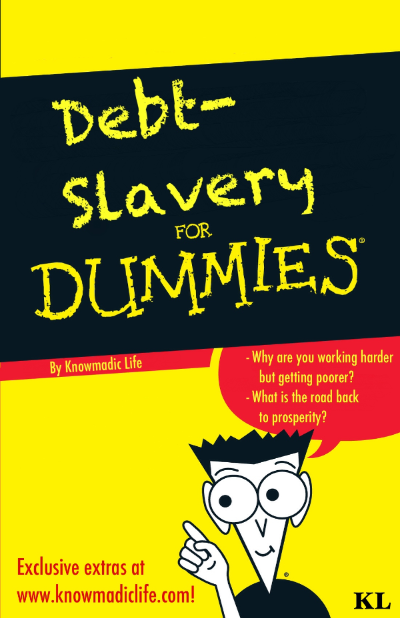 Let me sum it up for you… As of right now, we have NO DEBT LIMIT! And on Thursday, October 17, 2013, Jack Lew (our Treasury Secretary) borrowed 328 Billion Dollars! That’s ONE THIRD of a Trillion! Respectfully submitted by SilenceDogood2010 this Nineteenth Day of October in the Year of our Lord, Two Thousand Thirteen. Well well well…. Looks like the liberal democrats in Chapel Hill are up to no good. What would you think about a NC State employee using the email system to blast out invites for a NC Legislative Black Caucus Town Hall meeting? NC State Employee Handbook page 11. Click to enlarge. NC State Employee Handbook Page 12. Click to enlarge. § 126-13. Appropriate political activity of State employees defined. Respectfully submitted by SilenceDogood2010 this Fifteenth Day of October in the Year of our Lord, Two Thousand Thirteen. 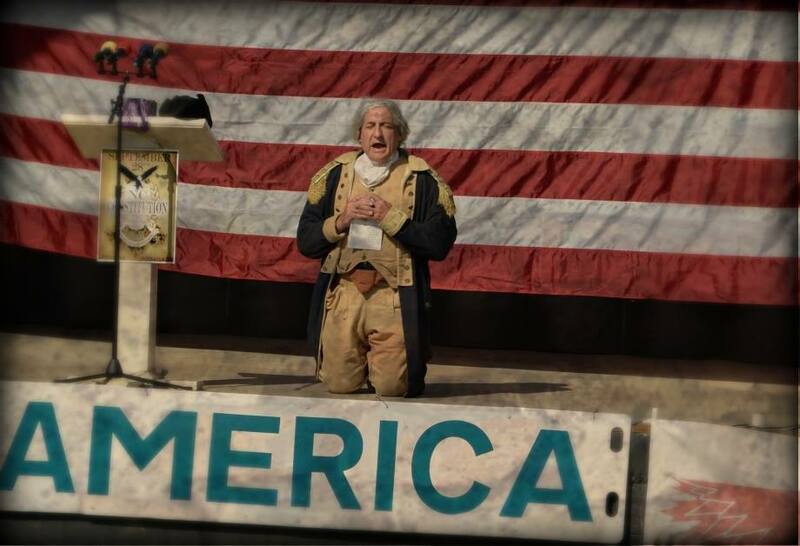 Simple list of videos from the NC Constitution Day TEA Party Rally held at Jomeokee Park on September 28, 2013. Thanks to Major Dave for putting this list together. Respectfully submitted by SilenceDogood2010 this Eighth Day of October in the Year of our Lord, Two Thousand Thirteen. Joe Dan Gorman, and his JoeDanMedia has a “REALLY BIG SHOW” (said in my ‘Ed Sullivan’ voice) this morning. It features Wild Bill For America too. The Rebellion of the SHEEP! 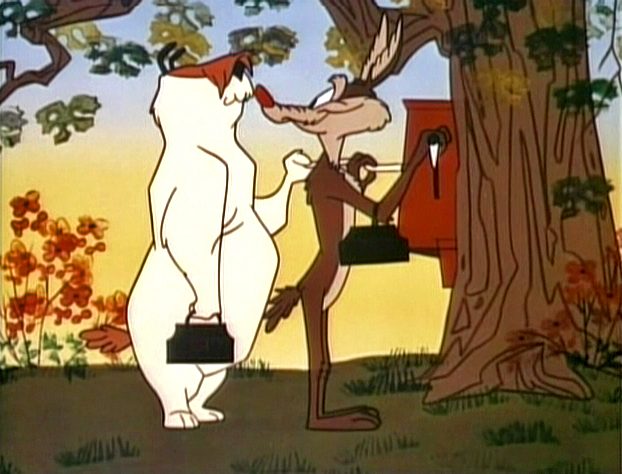 Morning Ralph… Morning Sam! Please visit his website too and don’t forget to ‘Subscribe” to his YOUTUBE Channel to get ALL the NEW Videos. And IF you want to see Wild Bill ‘Daincin’ (spoken like Ernest T. Bass), HERE ‘TIS! Respectfully submitted by SilenceDogood2010 this Sixth Day of October in the Year of our Lord, Two Thousand Thirteen. I did some MORE DIGGING and this organization is connected with some of the MOST EVIL people on the planet. Majority of them are from Chicago too. Notice they are not shutdown. Screengrab of their homepage. Click to enlarge. Matthew C. Armstrong is an author, speaker, and strategist on issues related to public diplomacy. In 2011, he served as executive director of the U.S. Advisory Commission on Public Diplomacy. Previously, Armstrong was an adjunct professor of public diplomacy at the Annenberg School of Journalism and Communication at the University of Southern California. 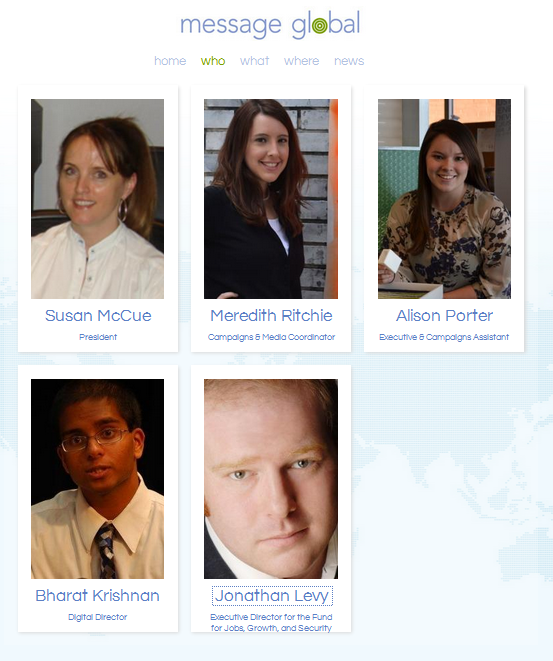 Susan McCue is President of Message Global, a strategic advocacy firm she founded in 2008 for social action campaigns. She was the founding President and CEO of The ONE Campaign to combat extreme global poverty and was Chief of Staff to Senate Majority Leader Harry Reid from 1999 to 2007. Before that she held numerous communications positions in government and campaigns. She is currently Vice Chair of Humanity United and a member of the Council on Foreign Relations. You should peruse THIS groups site. Read about what these ‘TRAITORS’ have accomplished once you go to the site. Click to enlarge. John F. Kerry Secretary of State – Do I even need to say anymore? Michael P. Meehan – After 23 years of work in the U.S. Congress, congressional and presidential campaigns, Meehan for the past six years has built successful communications strategy and public relations firm, VennSquared Communications. As president and CEO, Meehan’s firm provides strategic communications for dozens of Fortune 500 companies, foundations, trade associations and political and issue campaigns. On Capitol Hill, Meehan has served in senior roles for U.S. Senators John Kerry, Barbara Boxer, Maria Cantwell and former Senate Majority Leader Tom Daschle, and Congressman Vic Fazio and John Olver. From Senate Chief of Staff to top political and communications posts at the three national Democratic Party Committees (DSCC, DCCC and DNC), Meehan has held positions of influence in the public policy and media relations arenas. Jeffrey Shell is president of Universal Filmed Entertainment. He previously served as president of NBC Universal International from 2011-2013 and as president of Comcast Programming Group from 2005 to 2011. Prior to joining Comcast, Shell held a number of positions, including CEO of Gemstar TV Guide International and President of the FOX Cable Networks Group. As president of the FOX Cable Networks, he oversaw the operations of FOX’s entertainment and sports cable programming businesses. He currently serves on the board of the National Constitution Center. Shell earned a B.S. in Economics and Applied Mathematics from the University of California, Berkeley and an M.B.A. from Harvard University. Shell was confirmed as Chairman of the Broadcasting Board of Governors on August 1, 2013. The Board. Click to enlarge. Respectfully submitted by SilenceDogood2010 this Fifth Day of October in the Year of our Lord, Two Thousand Thirteen. Have You Ever Heard of The BBG? 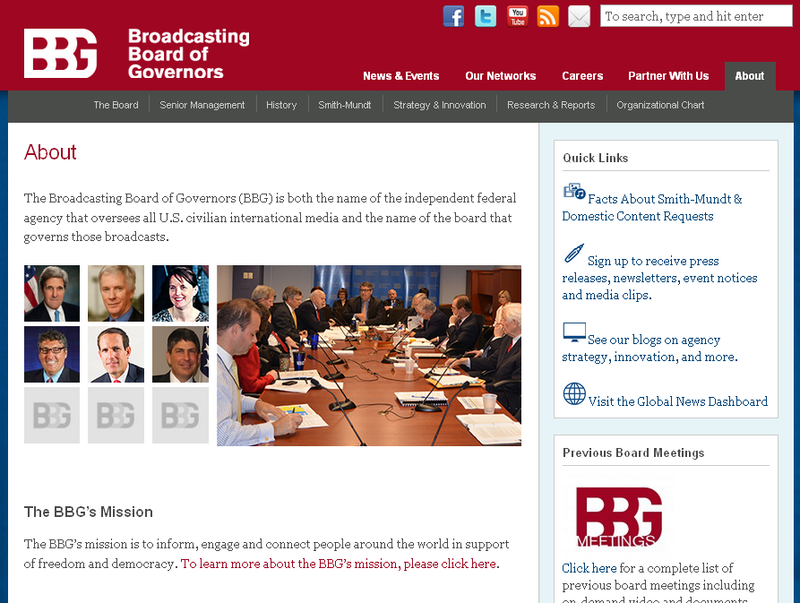 The BBG = Broadcasting Board of Governors. 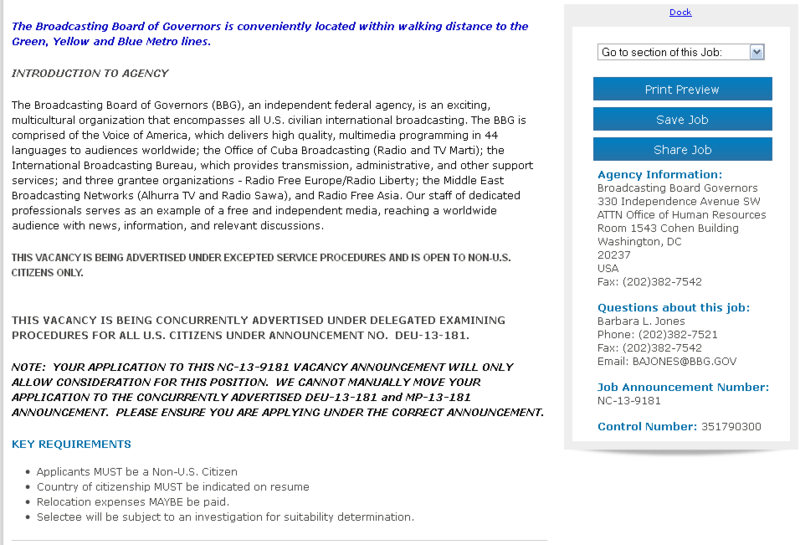 A federal agency that is funded by We the People…..
Alhurra is operated by the non-profit corporation “The Middle East Broadcasting Networks, Inc.” (MBN). MBN is financed by the U.S. Government through a grant from the Broadcasting Board of Governors (BBG), an independent federal agency. 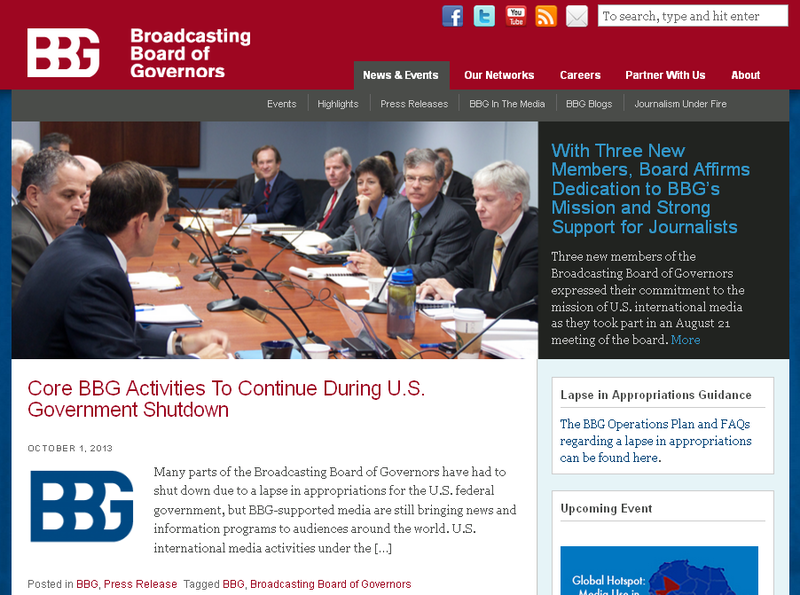 The BBG serves oversight and as a firewall to protect the professional independence and integrity of the broadcasters. I thought Nancy Pelosi said that the cupboard was bare and there were NO CUTS that could be made. I think I’ve just found $0.767 BILLION that could be cut. The BBG! BBG had 3,200 employees and a budget of US$535 million in 2002. Funding – The BBG solicits annual funding from Congress via a proposed budget summary which is also available on their website. The Board submits an annual budget submission in which they lay out specific initiatives. Initiatives in 2011 included improving the global satellite distribution capacity, creating Radio Free Asia video programming and improving distribution of Voice of America content. Announced in April 2011, the BBG will receive $10 million from Congress. During the federal funding dispute for the fiscal year 2011, President Obama sided with the BBG agreeing to language that the organization would “expand unrestricted access to information on the Internet.” This work includes anti-censorships campaigns in China and other repressive regimes. Their 2012 budget request was US$767 million. Digging a little deeper into this agency, I found THIS GEM —- A JOB Opening that is posted. I created these screengrabs because I KNOW, once I publish this info, it will be scrubbed from the net. Warning: TAKE your Blood Pressure meds because you WILL BE UPSET! Screengrab of a JOB opening there at BBG. Page 1 —- Click to enlarge the image. Page 2 of the JOB Opening. Click to enlarge. Now, for the TEXT and some highlights. 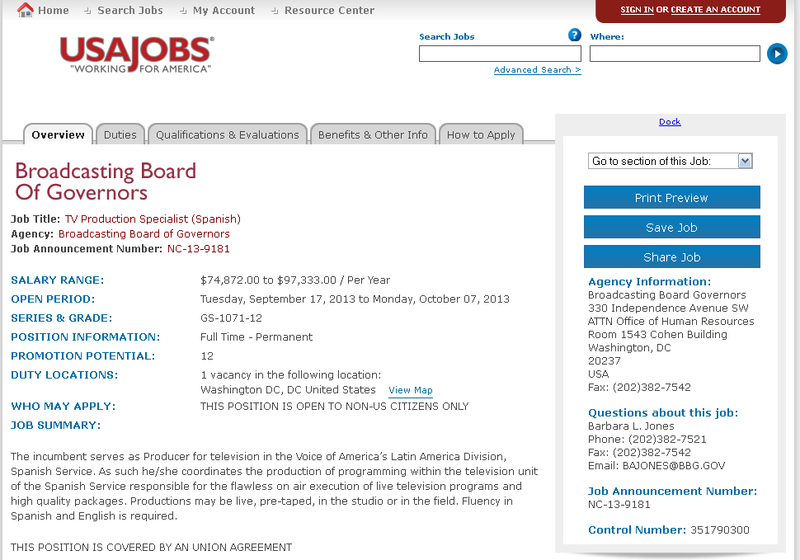 JOB SUMMARY: The incumbent serves as Producer for television in the Voice of America’s Latin America Division, Spanish Service. Relocation expenses MAYBE be paid. Selectee will be subject to an investigation for suitability determination. Why are we hiring NON US CITIZENS ONLY and paying them close to $100,000.00 per year? Respectfully submitted by SilenceDogood2010 this Fourth Day of October in the Year of our Lord, Two Thousand Thirteen.